If someone has money to spend, they’re doing something right. If you want to get hired by high-value clients, you need to remember that they don’t have time to waste. Unlike bottom-of-the-barrel clients that treat you like a commodity, micromanage, and demand revision after revision after revision, high-value clients value their time. They will actually pay more to get results in less time. You have to act like the opposite of a commodity. A commoditized technician is someone who performs tasks and gets paid by the hour. They’re incentivized to make a job take longer, because they’ll get paid more. Of course, this also means that the kind of clients they attract want to pay them as little as possible. High-value clients will pay more to get results in a shorter amount of time. That means if you have the experience to produce great results in a short amount of time, you actually get paid more to work less! But to attract these clients, you must operate differently. You need to stop making them do work. What does that mean? That means stop providing OPTIONS. Start providing SOLUTIONS. Cheap clients demand many options. They have all the time in the world to waste on picking between many options. High-value clients demand solutions. They want you to do the work and apply your expertise towards picking the best concept and presenting only that solution. They don’t want you to waste their time. That’s exactly what you’re doing when you provide multiple options instead of one solution: you are wasting the client’s time and you are making them do your job. Only amateurs make the client do their job. People with money to spend don’t have the time. Stop making high-value clients do work, because they value their time more than their money. High value clients pay more for results in a shorter amount of time. One red flag should immediately disqualify a potential client—don’t justify red flags. Set yourself up to have the freedom to say yes to the right opportunities. High paying clients are looking for solutions. 02:37 Sean: The rule is that the people with money to spend don’t have the time. Let’s break it down a little bit more. If someone has money to hire you, they’re doing something right. They’re spending their time in ways that are giving them maximum returns. They’re doing something right in their business. If they have the money to hire you, it means that they’re spending their time doing whatever it is that’s working for them and having enough money to pay you and pay you well. That means they don’t have the time. 03:11 If you want high-value clients, I’m not talking about any clients, because you can get any clients doing anything and you’ll have any kind of problem. High value clients value their time more than their money, so you need to stop making them do work if you want to get work. 03:31 Stop making them spend their time. Take as much off of their plate as possible. Handle as much as possible. Stop making them choose from options, and start providing solutions to their problem. Give them the best design, the best concept, the best product, not options. To those of you who say, “But Sean, my clients would never go for that,” I bet they wouldn’t. How much do they pay you? Not very much. 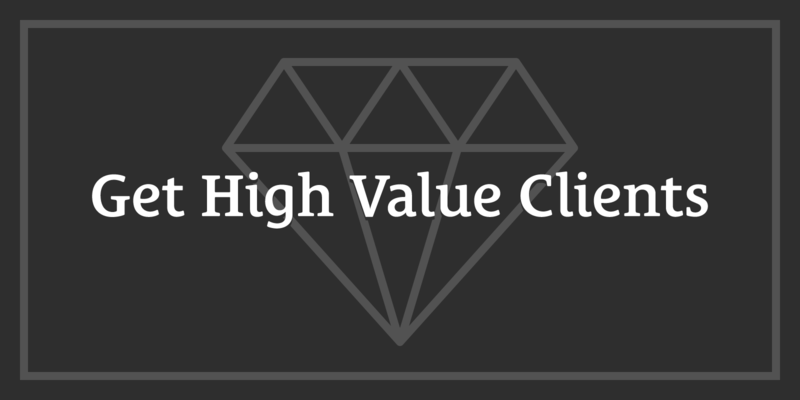 I’m talking about high-value clients. You need to change your mindset, the way you think. 04:10 If you want clients that pay you well, you need to understand how they think. It’s a totally different psychology. Don’t hold yourself back here. The clients who want you to make revisions, changes, do what they say, create what’s in their head, have you change it over and over and over again, and ask for more and more options are not high-value clients. Those are bottom of the barrel clients, commodity clients. They look for commodity consultants, freelancers, or whatever it is that you do. You don’t want those people. 04:45 When you work by an hourly rate, when you say, “This is what I charge by the hour,” you’re incentivized to maximize the amount of work you do. How can you do more? How can you take more time to maximize your pay? You should be maximizing the value to the client. High value clients pay more for results in a shorter amount of time. They pay more to get things sooner. You need to make everything incredibly easy. They’re not like the other clients. They’re totally different. You will only get high-value clients when you start changing the way you attract them and changing the way you project who you are and what you offer. You have to filter your clients aggressively. 05:40 There are always going to be clients who want you to do what they say, who want you to make multiple revisions and provide multiple concepts. Those are not your clients. The more of them you take on, the less time you have to take on the right ones. It’s not just that you have less time, but you have less availability and less awareness of the high-value clients you could be working with. When your availability is maximized and your time is short, you don’t have the ability to take on the good kinds of clients that you want. That means that you have to start saying no to the wrong clients. 07:12 Those are all red flags. Filter aggressively and start saying no. You don’t want these clients. That means that you have to get out of Scarcity Mindset, like we talked about a few episodes ago. You have to set yourself up to have the freedom to say yes to the right opportunities, and that means that, sometimes, it’s going to be a while before you find the right client, before you attract them. You need to be covering your bills in other ways. 07:38 If you are desperate and you’re taking on clients you shouldn’t be taking on to pay the bills, you’re never going to get a high paying client, a high value client. They smell desperation a mile away. You don’t chase these clients—you can’t. You have to attract them. They need to come to you, and they need to see you as the solution, as the professional. 08:12 High paying clients are looking for solutions. The more they pay, the less they want to have to do. When you present options to your client and you say, “Which one of these do you want to do?” You’re forcing them to do work. Understand this. You think that because your industry standards say that options are good, you’re providing them value by giving them options. You’re not. You’re sucking value from them because you’re sucking time from them, because it takes time to do work. Choosing from multiple options to decide which is the best is forcing them to do work, and that’s your job. 08:49 You’re forcing them to do your job. Your job is to provide the best solution. Technicians provide options and make their clients do work. Professionals provide the best solution. If you’ve narrowed it down to two concepts or several options, your job is not done. To level up, you must understand the psychology of high paying clients. Understand what they want to achieve. High paying clients place a significant value on their time, so they’re willing to pay you to solve a problem that would otherwise cost them time. 09:32 In the last episode, I mentioned that we’ve been doing live training for Supercharge Your Writing, and we had over 700 people on that training. It was two hours of jam-packed value. A lot of you still don’t go to the websites when I mention them, you’re not signing up and subscribing, and you’re missing out. You missed out on the Supercharge Your Writing live training, but we’re going to do it again. This time, we’ll do it with Value-Based Pricing. 09:58 What we’re talking about today here is getting high-value clients. We have been working on the Value-Based Pricing course for eight months. At the end of May, we are finally launching the public version for the Value-Based Pricing course. We’ve been going through a pilot program, developing this course with a group of people since November. We’ve been developing it for eight months and I’ve been teaching on it for years. There are some incredible tools that Justin has developed, multiple tools that help you calculate a value-based price. 10:37 We set it all up—helping you avoid Scarcity Mindset, helping you learn very specifically how to attract clients, how to find the red flags, what to do in the middle of the value discovery process, when a flag is raised, how exactly you deal with that and what you do, all of it. We are including that in this course that launches in May. It’s at ValueBasedPricing.com, and you need to sign up. We are going to do some live training in April and May. I’m going to be pushing for doing at least two of these trainings. 11:17 This is going to be hundreds, if not thousands, of dollars of value for you. With the free material we put out last year, in 2015, people have been saying that they’ve been able to charge thousands more. They say, “If you sell this course for less than $5,000, I’m going to be angry.” They’re going to be angry, but it’s going to be awesome. It’s going to be valuable. These live trainings are going to be epically valuable, and you don’t want to miss them. Trust me. Go to ValueBasedPricing.com and sign up—we’d love to have you there.